Warning: This is the longest and perhaps most important page on this website. Most new clients at Future Medicine Now embark on a seemingly complex, multifaceted orchestration of treatment, dietary modification, Chinese herbal medication, and lifestyle changes — all personally tailored for each individual and their condition. We don’t treat disease — we treat people. A person with, say, breast cancer, is going to require a different approach and sequence than another person with breast cancer. The same can be said of migraines, depression, thyroid dysfunction, diabetes, shoulder pain, and autoimmune disorders… you get the picture. Their health picture will be complex (rather than simple). Their diets will not be serving them well. I can count on one hand the number of clients I’ve seen who haven’t fit this picture. At Future Medicine Now, food choices and dietary habits tend to outweigh all other approaches to obtaining excellent health, regardless of one’s degree of illness. Oriental Medicine’s knowledge of food and herbal medicines is so rich that nearly all diagnosis and treatment can be facilitated through these modalities. And while this is generally true of traditional medicine in the Orient, it is even more pronounced when using these principles to treat Western clients. It shouldn’t be difficult to imagine why this is true. Dietary choices are not only one of the most consistent influences on our health — second only to our own attitude and attention — they are also the most misunderstood and confused area of study for the modern seeker of good health in the West. If you’re listening to advice telling you that a given food or a given diet is good for all humanity, beware. The knowledge and wisdom of your source is insufficient to provide a high level of truth. This simple measure will eliminate about 99% of the advice on the web and other media. Having pursued understanding of dietary principles for over forty years, I have been blessed with some remarkably good guidance. And I’m pleased to say the mistakes I’ve made have been more instructive than damaging. While we may recognize a distinct beginning to this pursuit, we come to see that it does not end — it only refines itself. If this is true, then those systems of knowledge with the longest history tend to be endowed with the keenest perception. The most dependable principle I have discovered for finding the wisdom of food is to rely on dietary systems with a history of at least two millennia. The two most obvious of these, Ayurveda and Oriental Medicine, embody a depth of perspective that modern pundits and researchers simply cannot match. These two systems further stand out by having evolved within the hearts of the longest-lived cultures on the planet, both of which have strong traditions of devotion to conscious awareness — awareness of all things. This latter quality is, I believe, the attribute enabling each of them to recognize, appreciate, and understand the energetic subtleties of food for the attainment and maintenance of high level health. When I speak of the ‘energetics’ of food, I’m referring to ‘qualities’. We, however, live in a culture devoted to ‘quantities’. Energetics are foreign and unknown to us. Worse, they are disdained and demeaned as inferior before our cultural gods, science and its means of perception — quantity. Quality and quantity may be viewed as the polar opposite ends of a spectrum of value. A laboratory is required to perceive quantitative values of foods (e.g. calories, grams of protein, transfatty acids); not so, qualities. Okay, so what’s a ‘quality’ of food? Well, let’s start with an obvious one: taste. Not much argument here — most food has taste. But what does it mean? There are five tastes in Oriental Medicine: sour, bitter, sweet, pungent, and salty. Each of these tastes has specific effects on the organism and its complex systems. I've got a ‘sweet’ junkie on my hands. A Doctor of Oriental Medicine doesn’t care whether or not stevia has calories (quantitative value) — it’s the taste itself which causes responses. In fact, this is now being verified by studies: stevia affects pancreatic response without containing sugar. Hmmmm. Taste determines what organ system a food ‘enters’ and how it affects that system. Slightly more subtle is the quality of temperature. You’d probably quickly deduce, for instance, that ginger is warm or hot — and you'd be correct. 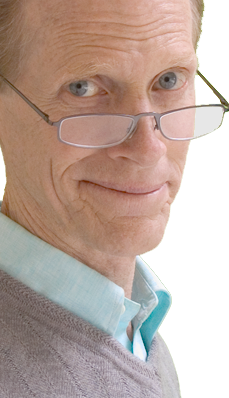 And if you’ve read much of this website, you probably know that soy and its products are cold. But, tell me the energetic temperature of lamb, buffalo, chicken, and fish, or peas, cucumber, sweet potato, and celery — and which are the colder or hotter of those. Gets complicated fast, doesn’t it? Who is going to tell us these things other than a culture which has been integrating such principles into its medical paradigm for three thousand years? But who cares? Why is temperature important anyway? Oriental Medicine’s objectives revolve around a central theme: balance. Without it, good health cannot be had. With it, good health is hard to avoid. With too much heat or cold (or anything else), balance is lost, and problems will manifest. These imbalances may result from constitutional tendencies, or they my arise from dietary indiscretions. Other sources of disharmony exist, of course. But if we have, for instance, a stomach disorder and the cause of the disorder happens to be heat (which is a pathogenic factor in Oriental Medicine), then ginger is only going to make things worse, right? No matter how ‘good’ ginger is for the stomach, it’s the wrong choice in this case. Does that make ginger ‘bad’? Of course not. We’re not promoting food moralism. We’re seeking wisdom. Or a food’s symptomatic effects. So, is it any wonder we are so confused about what ‘diet’ to follow? Trust me, the authors of the diets are more confused than anyone else. Worse, actually — they believe in their confusion! Hopefully, you now have an inkling of the meaning and relevance of ‘energetics’. Let’s now contrast this ‘new’ information with the concepts which preoccupy Western thought about food. Food concepts don’t get any more quantitative than that of ‘calories’. This word is totally ‘lab speak’. 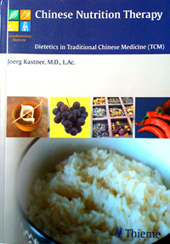 From the perspective of Oriental Medicine, calories are irrelevant in making food choices. Yet this is what Americans do — they count calories as if their health depended on it. What do calories tell us about a food? Do they tell us if a food is good for us? Are they an indication that consuming that food will improve our health? Calories tell us nothing about the value of a food. Most importantly, they cannot even hint at what effect a given food will have on a health condition we may have. Calories are a perfect example of America’s fascination with science and numbers. And as long as we allow our food choices to be guided by such nonsense we will never experience optimal health and longevity. Well, I question that. But let’s take a look at what they are talking about. Let’s look, for example, at a word bandied about like a golden tennis ball by the media, alternative medicine practitioners, food gurus, and nutritionists: ‘carbohydrate’. This concept is focused upon as if it were the ball to watch. Ironically, the profession which doesn’t have much to say about carbohydrates is conventional medicine, but it can be excused because its practitioners don’t even acknowledge the importance of food and its relevance to health. Everyone else, however, uses this word with great authority, as if knowing something about carbohydrates signifies expertise and wisdom. Well, let’s take a closer look at this word, this concept. Carbohydrate, in this context, is used to describe a food group. What's included in this food group? White Sugar. Pure, highly processed, sucrose, from sugar cane. Better known as ‘white death’ to those who value their health and monitor their food choices. High Fructose Corn Syrup is an exceptionally unique example on two counts. And its exceedingly cunning effects on the physiology of its victim. Its contribution to obesity far exceeds that of white sugar. Not to mention (I know, this is three) that it contains mercury, a neurotoxin. But that’s another subject. But wait, how about… Broccoli? Yes, these are all carbohydrates, as well as thousands more, equally dissimilar foods and food-like substances. How could that be? The term carbohydrate is a description based on molecular chemistry, simply meaning that a substance is composed of carbon, hydrogen, and oxygen. Purely quantitative evaluation. And from the vantage point of Ayurveda and Oriental Medicine, valueless in terms of health and medical treatment. This and other concepts like it constitute the height of Westerners’ understanding of the food they eat. And they are the only tools we have for discussing the ‘values’ of food. Please tell me how an expert or anyone can have a meaningful discussion about food choices when restricted to utterly meaningless concepts and communication tools?! It cannot be done. This is the state-of-the-art of Western knowledge of food. This is the epitome of Western technology’s perception and understanding of a most important factor in determining our health. And our collective state of health is an accurate reflection of this abysmal level of evolution — or is it devolution? In case you entertain any lingering illusion that modern nutrition is a brilliant, mature science, please take a closer look. I wholly agree with Michael Pollan when he suggests that nutrition today is approximately where surgery was in the 1650s. During the same talk in which Pollan made this astute observation, he pointed out an additional pitfall of our cultural tendency to worship science. By identifying food as an incidental vehicle for delivering ‘nutrition’ to our bodies, we have deferred our own observations, knowledge, and experience of food to a science of micro-components which can only be discerned, understood, and explained by a cadre of experts — the priests of a strange and distorted religion — whose message leaves us confused and in compromised health. The Western diet, a product of modern nutrition, marketing schemes, and greed, is the one diet which sickens and kills it adherents. Cosmopolitan citizens of the world who have observed the Western diet arrive in indigenous cultures are faced with the undeniable conclusion that our preference for lots of meat, highly refined, processed food-like substances, and very little fresh vegetables and fruit, invariably increases heart disease, cancer, obesity. Despite what we continually hear from the media, these health conditions are not the killers of our time, but merely symptoms. Our diet and lifestyle are the killers. We continue to drift further from command of our own vessel. By creating this alternate reality — an ‘improved’ version of nature — those who control the wealth of our planet have succeeded in diverting us down a path increasingly removed from our natural state. “Better Things, for Better Living… Through Chemistry” was DuPont’s advertising campaign when I was growing up. We have allowed this matrix to become our reality. Humanity can ill afford to follow this Pied Piper to its destination. We do have a choice. There exists a mature system of medicine, and the food we eat is an integral part of that system. There is an intact, coherent view of our physical universe, which perceives with clarity the origins of our suffering, as well as the clear path to good health. But it won’t be handed to us on a platter. We must seek it out and embrace its wisdom. But it is here, quietly meeting the needs of the 21st century. Most challenging, we must be willing to recognize and turn our backs on that which no longer serves us. We have to let go of the false in order to receive the truth. This is as true for inhabitants of Asia as it is for Westerners. No one is exempt from this global trend. Overly dramatic? Time will tell. What does your own life experience tell you? First of all, may I commend you for having read this far? If you feel left out on a limb, please know that I didn’t take you here. Each of us is responsible for where we reside, and, most importantly, for where we go from here. If you are truly sincere in your search for reliable guidance and the most resilient health you can obtain, and if you persevere, you will find your perfect next step. In addition to the two hints offered at the beginning of this page, it is vitally important to take more definitive action. Find someone who not only practices this medicine, but who walks the talk — someone who lives the medicine. And glean what you can from them. The wisdom and understanding I’ve described here simply does not exist elsewhere. Ohp! One more key qualification: find someone who has the balls to tell you what needs to happen! Many are too timid to get the job done. If you have a serious or debilitating condition, consider a commitment to work closely with one of these individuals. Simple curiosity may be served by investigating some of the following books. These recommended books can be purchased in our office, or if you prefer, the links below take you to amazon.com for immediate purchase online. This is an in depth look at the energetics of food combined with modern nutrition — an encyclopedic reference, required for serious understanding and intelligent choices. An Englishman’s look at Chinese energetics of food, Legget’s book presents the principles in an easy to assimilate manner, and a third of the book contains many lovely recipes. A quality, laminated wall chart for quick reference. Put it on your refrigerator or inside a cupoard cabinet. 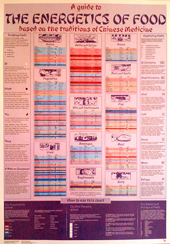 Leggett’s chart is a handsome, beautifully referenced, easy to use chart with an amazing amount of information on it. Temperatures are depicted in colors for a remarkably comprehensive list of foods. Organs affected, as well as tonification of yin, yang, qi, blood, and essence are clearly depicted. And you can easily refer to pathogenic factors each food inhibits. If you have Leggett’s book, you’ll know what these things mean, and how to make intelligent choices. 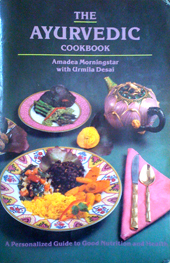 Ayurvedic medicine, too, has a clear understanding of the energetic nature of food and how it fits into the medicine. Gain a slightly different perspective of the same principles, and acquire some fabulous recipes at the same time! Many of these have been staples in our kitchen for years. We never tire of the seductive and nourishing flavors. by Joerg Kastner, M.D., L.Ac. Priced as a textbook, this book is beyond the reach of the casual reader. This is unfortunate, because it excels in its clear and lucid presentation of the principles, as well as details. Recipes included. Well worth the investment, if it’s within your budget. A gem from Dr. Mao. 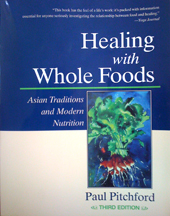 This book goes beyond the energetics of food. If you assimilate the nuggets contained within, you should have a very good feel for the Oriental perspective on food, health, life, modern nutrition, and more. 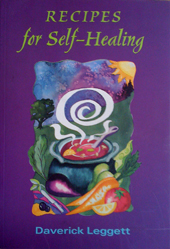 This book has nothing to do with energetics of food, nor does the author possess that knowledge. 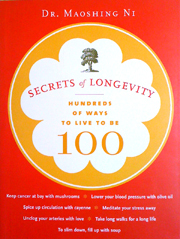 It is, however, an excellent book for debunking food myths our culture has embraced for generations. Sue feels this is a good cookbook for Blood Type Os. 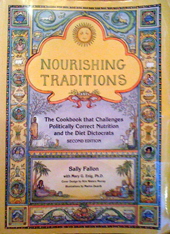 I feel that Sally’s book is best used and appreciated after one already has a substantial understanding of Oriental principles under one’s belt. This facilitates the wisdom to pick and choose among the ideas presented. Nourishing Traditions is a valuable book, which has a wealth of ‘new’ ideas and recipes, most of which, in fact, herald from the time of a much wider agrarian culture.